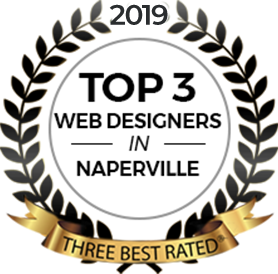 Design & Promote has been named one of the Top 3 Web Designers in Naperville, by ThreeBestRated.com! Handpicked from multiple web design firms in the Naperville area, Design & Promote is proud to have been recognized with this distinction for the second year in a row! ThreeBestRated.com identifies the top 3 businesses by town/city using a 50-Point inspection based on customer reviews and satisfaction, history, ratings, and more. Having served the Greater Chicagoland area with Digital Design & Marketing solutions since 2007, we set ourselves apart from our competition by offering creative design and marketing solutions to surpass the goals of customer communication and proven results, a focus that has allowed us to grow over the years and retain long-term customer relationships. We provide value to our clients, providing them with data for optimal decision making in order to plan appropriate marketing strategies. Design & Promote offers affordable custom websites built with the customer in mind. We take the time to get to know our clients and their expectations, and provide a high-quality product to compliment and expand their brand. To be considered among the top designers in Naperville is a tribute to the work ethic and service of our team at Design & Promote. To learn more about Design & Promote and view all of our awards, visit our Who We Are page. For more information on working with Design & Promote, please fill out the contact form on the right of this page.